It's become as much a winter tradition as eggnog at Christmas and champagne on New Year's Eve  the first major snowstorm of the year bringing out the climate-change skeptics. And the bona fide blizzard that has frozen much of the Northeast just a few days after winter officially began definitely qualifies as major. But while piles of snow blocking your driveway hardly conjure images of a dangerously warming world, it doesn't mean that climate change is a myth. The World Meteorological Organization recently reported that 2010 is almost certainly going to be one of the three warmest years on record, while 2001 to 2010 is already the hottest decade in recorded history. Indeed, according to some scientists, all of these events may actually be connected. One theory is that a warmer Arctic may actually lead to colder and snowier winters in the northern mid-latitudes. Even as countries like Britain  suffering through the coldest December on record  deal with low temperatures and unusual snow, the Arctic has kept on warming, with Greenland and Arctic Canada experiencing the hottest year on record. Temperatures in that region have been 5.4°F to 7.2°F (3°C to 4°C) above normal in 2010. As a result, the Arctic sea-ice cover has continued to shrink; this September, the minimum summer sea-ice extent was more than 770,000 sq. mi. (2 million sq km) below the long-term average, and the third-smallest on record. Snow may be piling up in midtown Manhattan, but the Arctic is continuing its long-term meltdown. The loss of Arctic sea ice helps accelerate the warming of the atmosphere in the far north, thanks to what's known as the albedo effect. White ice reflects sunlight into space, cooling the air, but when ice melts and is replaced with dark ocean water, the effect is reversed and more of the sun's heat is absorbed. As the Arctic air warms, it raises the altitude of discrete areas of high pressure, which can then alter wind patterns. This, in turn, can weaken the jet stream, allowing more cold air to seep out of the Arctic and into Europe and the eastern U.S. As the authors of the National Oceanic and Atmospheric Administration's recent "Arctic Report Card" put it, "There is evidence that the effect of higher air temperatures in the lower Arctic atmosphere in fall is contributing to changes in the atmospheric circulation in both the Arctic and northern mid-latitudes. Winter 2009-2010 showed a new connectivity between mid-latitude extreme cold and snowy weather events and changes in the wind patterns of the Arctic; the so-called Warm ArcticCold Continents pattern." The theory seems counterintuitive, but as Jeff Masters, a meteorologist who writes the great Wunder Blog at Weather Underground, put it in a recent post, it makes sense: "This pattern is kind of like leaving the refrigerator door ajar  the refrigerator warms up, but all the cold air spills out into the house." The planet overall is still warming  and the Arctic fastest of all  but the cold air from the far north can result in biting winter weather and major storms, for a while at least. That's not the only theory. Judah Cohen, the director of seasonal forecasting at the environmental research firm AER, has written that increasing seasonal snow cover in Siberia may drive extreme winter weather. Even as the planet has continued to warm and the Arctic has melted, seasonal snow cover has increased in Siberia, especially north of high Asian mountain ranges like the Himalayas. (As the climate warms overall, the atmosphere can hold more moisture, which can lead to more precipitation  falling as snow in places like Siberia that remain relatively cold.) All that Siberian snow creates a dome of cold air near the mountains, which bends the passing jet stream. Instead of flowing west to east, the jet stream moves in a more north to south fashion, carrying cold air south from the Arctic in the eastern U.S. and in Europe. Cohen's theory isn't accepted by all climate and weather scientists, but the National Science Foundation has said that in past years his model has predicted winter weather more accurately than traditional forecasts. Of course, it's important to remember that weather isn't the same as climate  a single storm, or even a single cold winter, can tell us little about the overall climate. Anomalies do happen, and sometimes they dump 20 inches (50 cm) of snow on Central Park. The systems that govern weather on this planet are incredibly complex, and our ability to understand why individual events occur  and to forecast them for the future  is still imperfect. That more than anything is what drives  and distorts  so much of the stubborn debate over climate change. Just because climate models predict that the planet will continue to heat up in the future as we continue to pour greenhouse-gas emissions into the atmosphere doesn't mean that warming will be a steady, even process. Far from it  and as parts of the planet warm far faster than others, extreme events, including winter ones, may become more common. 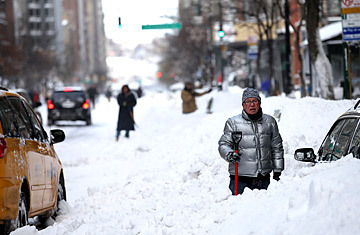 New Yorkers cursing Al Gore as they dig out their cars should recall this past July  the second hottest month on record in the city. Unfortunately, that unpredictability is going to make adapting to a warmer world even tougher. As climate change appears to trigger harsher winter events in parts of the world, that's not an effect that will last forever. As the world warms, even cold air from the Arctic or Siberia may not be enough to offset the greenhouse effect, and major snowstorms like the one the Northeast just experienced could be a thing of the past. That might make for less snow shoveling  but on the whole, it won't be a very pleasant planet to live on. See photos of how global warming threatens penguins. See TIME's special feature on environmental toxins.